50,000 points Earn 50,000 bonus points after you spend $4,000 on purchases in the first 3 months from account opening. Luxury travel perks and rewards. 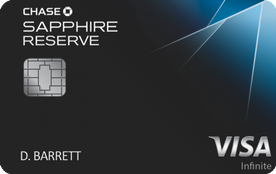 In addition to 3X points on worldwide travel and dining, Sapphire Reserve offers a $300 annual travel credit and access to 1,000+ Priority Pass airport lounges. The Chase Sapphire Reserve is one of the best travel credit cards. Our take: The price of admission for this luxury card from J.P. Morgan Chase is steep, but its large sign-up bonus and generous travel allowance more than make up for the card’s high annual fee.